« March 2 – There’s lots to crochet! 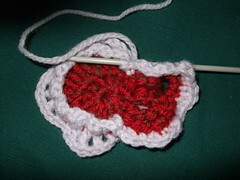 This entry was posted on Tuesday, 3 March 2009 at 7:19 am and is filed under books, crochet, games. You can follow any responses to this entry through the RSS 2.0 feed. You can leave a response, or trackback from your own site. Thank you! I have worked on not telling every last minute of everything (because I get annoyed reading that as well) so I’m glad that worked for you.